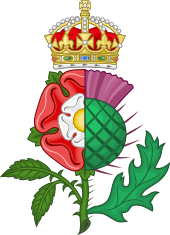 The White Rose en Soleil (imposed on a sun in splendour) of the House of York, on the livery colours blue and murrey of the Yorkist dynasty, surrounded by the royal motto 'Dieu et mon droit'. From a manuscript by Vincent of Beauvais (1478–1480), belonging to King Edward IV of England. 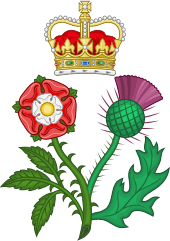 Heraldic badges are distinctive to a person or family, similar to the arms and the crest. 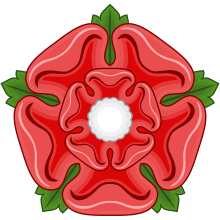 But unlike them, the badge is not an integral component of a coat of arms, although they can be displayed alongside them. Badges are in fact complete and independent and can be displayed alone. 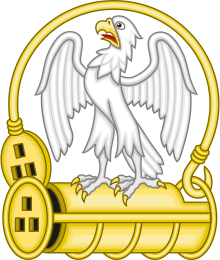 Furthermore, unlike the arms and crest, which are personal devices that could only be displayed by the owner, the badge could be easily borne by others, in the form of a cognizance or livery badge, to be worn by retainers and adherents. Badges are displayed on standards and personal objects, as well as on private and public buildings to show ownership or patronage. 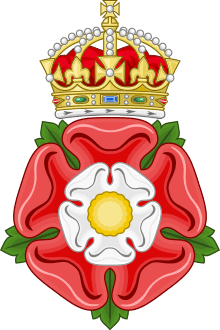 Royal badges have been in use since the earliest stages of English heraldry. 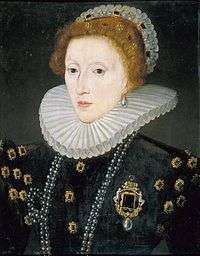 They are invariably simple devices, and numerous examples were adopted and inherited by various sovereigns. These are found in the glass and fabric of royal palaces and memorial chapels, and sometimes in the houses of those who enjoyed or anticipated royal patronage. The earliest royal heraldic badge is a sprig of common broom, said to have been worn by Geoffrey of Anjou in his cap. 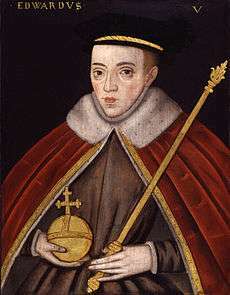 The broom plant or Plantegenest (planta genista in medieval Latin), thus became Geoffrey's nickname; 'Plantagenet'. 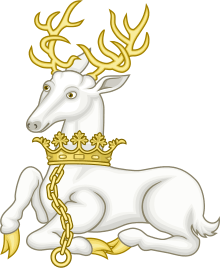 The heraldic device also became the name of the dynasty that was borne from him, which was to rule England for over 300 years. 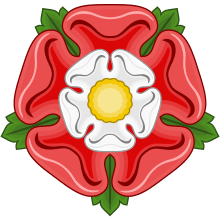 The Plantagenet kings would use this badge, sometimes combining it with other more personal devices. 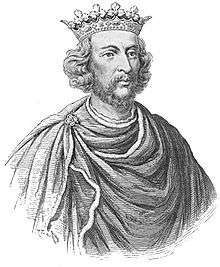 King Henry II used the 'planta genista' as well as an escarbuncle. 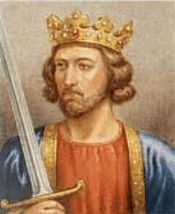 King Richard I used a star and crescent device, which was also adopted by his brother King John. 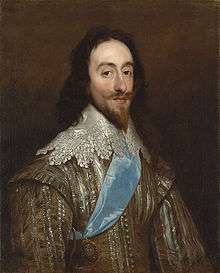 King Henry III adopted the broom sprig and the star and crescent. 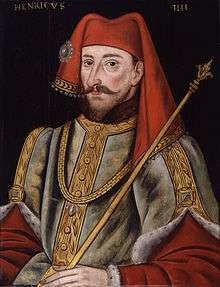 His son Edward I in addition to these, added the golden rose device that he inherited from his mother Eleanor of Provence. 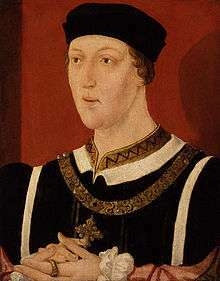 King Edward II further added the golden castle of Castile, inherited from his mother Eleanor of Castile. 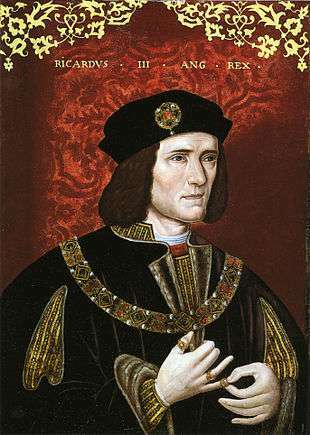 It was actually Richard of York, 3rd Duke of York who adopted the Plantagenet name for him and his descendants in the 15th century. 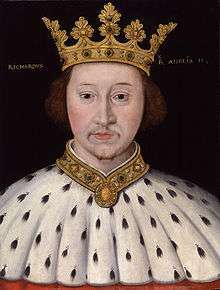 It is obscure why Richard choose the name but it emphasised Richard's hierarchal status as Geoffrey's, and six English kings', patrilineal descendant during the Wars of the Roses. 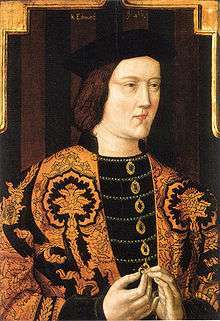 The retrospective usage of the name for all Geoffrey's male descendants became popular in Tudor times probably encouraged by the added legitimacy it gave Richard's great-grandson, King Henry VIII of England. 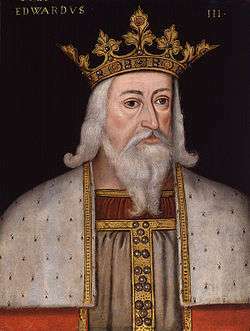 Badges came into general use by the reign of King Edward III. The king himself deployed many badges alluding to his lineage, as well as new personal devices. a Dragon Or, "clothed with the king's arms ... nicknamed 'Drago'"
an Ostrich feather encircled by a scroll bearing the word "SOVEREYGNE"
an Ostrich feather erect Argent with a small scroll across the lower part of the quill inscribed "Ich dien"
a Winged Time drawing Truth from a Pit, with the inscription "Veritas temporis filia"
an Altar, thereon a sword erect, with the words "Arae et Regne Custodia"
a Tudor rose, crowned with the motto "Rose sine Spina"
↑ Wagner, John (2001). Encyclopedia of the Wars of the Roses. ABC-CLIO. p. 206. ISBN 1-85109-358-3. ↑ Montagu, James (1840). A Guide to the Study of Heraldry. London: William Pickering. ↑ On a banner at Crecy, 1346. 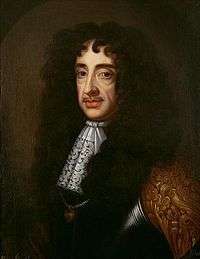 Chronicle of Geoffrey le Baker. 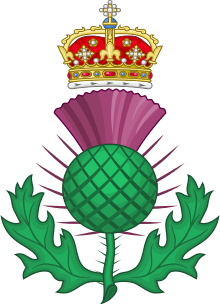 ↑ In 1801, imperially crowned, designated as badge for Scotland. Bedingfeld, Henry; Gwynn-Jones, Peter (1993). Heraldry. London: Bison Books Ltd. ISBN 1-85422-433-6. Fox-Davies, Arthur Charles; Johnston, Graham (1909). A Complete Guide to Heraldry. New York: Dodge Pub. Co. ISBN 0-517-26643-1. Siddons, Michael Powell (2009). Heraldic Badges in England and Wales. 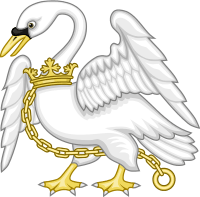 2.1 (Royal Badges). Woodbridge: Society of Antiquaries/Boydell. ISBN 9781843834939. 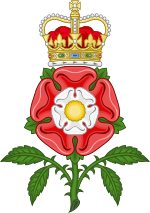 Wikimedia Commons has media related to Royal heraldic badges of England. This article is issued from Wikipedia - version of the 8/23/2016. The text is available under the Creative Commons Attribution/Share Alike but additional terms may apply for the media files.